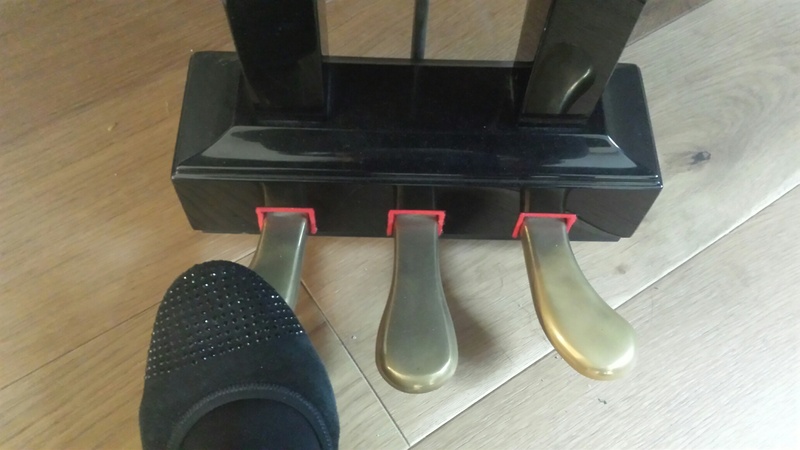 I’ve previously written about the Sustaining or Damper pedal here on this blog; it’s the foot pedal farthest to the right on a piano, irrespective of whether there are two or three pedals (grand pianos tend to have three whereas uprights often have two). You can read my post about the Sustaining pedal here. Today, I have focused on the left pedal, played by the left foot (as indicated in the photo above). The Una Corda is also known as the sordino, left, muting or soft pedal, and when written on the score, is a direction for this pedal to be depressed. Una corda means ‘one string’. By depressing the Una corda, the whole action and keyboard shifts to the right (on a grand piano), allowing the hammers to strike one string fewer than usual, therefore reducing the sound and resonance. Whilst the use of this pedal does reduce the sound, it also changes the character, adding a somewhat muted or muffled effect. On an upright piano, the left pedal moves the hammers closer to the strings (as opposed to shifting them), shortening the stroke and reducing the sound but not really changing the timbre. Therefore, much is dependent on the type and quality of the instrument regarding the effect of this pedal. Composers occasionally request the addition of the Una corda, as the photo above demonstrates; Hungarian Romantic Franz Liszt’s (1811 – 1886) instructions (at the bottom of the stave) in a slow, expressive passage in the monumental Dante Sonata (Après une Lecture de Dante S. 161 No. 7). However, many composers do not or have not marked its use in their scores, thus relying on a performer’s discretion and personal taste. When Una corda (or UC) is marked, depress the left pedal, lifting it when you see the marking, Tre corde (three stings; or TC): Due corde is another direction, and this refers to the left pedal being partly depressed. Rather like the Sustaining pedal, the Una corda is multi-layered. It’s possible to take the pedal down various degrees in order to achieve a profusion of divergent sounds. This will be challenging on an upright piano (as mentioned above), as the Una corda on these instruments tends to just make the overall effect softer, but on a grand, the changes are both effective and understated. To become accustomed to the left pedal, aim to experiment with a few scales. Start by putting your heel firmly on the floor with your body weight behind it. Then prepare to play the pedal with the ball (top of the ball) of your foot (towards the big toe). When depressing the pedal, observe just how little movement is necessary for the sound to change, usually from a distinctive, brilliant tone to a softer, muted one. You could try touching the pedal lightly at first, graduating to full use of the pedal, from the top to bottom of a four octave scale. Practice taking the Una Corda pedal down and then raising it varying degrees, concentrating on the colour and (probably to a lesser extent), the volume change. This can be a both interesting and helpful exercise. On some pianos, it can change the sound from quite penetrating or percussive, to a warmer, richer hue. A couple of other general suggestions for the una corda include employing it for accompaniment figures. This involves depressing the pedal where an accompaniment figure occurs (often in the left hand), and then raising the pedal for the melody notes. Considerable skill is required for this exercise, which should ideally be practised with exact application; the overall semblance is one of a hazy, subtle, perhaps slightly unfocused sound for the accompaniment figures, with a brighter, fuller, more colourful melody, soaring above. Try using the una corda to add a muted sonority to trills and ornaments; particularly long trills in higher registers on the keyboard. If the left pedal is applied towards the end of a fast trill, it can give the ornament a distinctly less sonorous, iridescent tone. Application of the una corda depends entirely on the context of the music. Its use is sometimes thought controversial in early music (where it’s often assigned to replicate the ‘echo’ effects demanded of the harpsichord), and any pedal employment should ideally be carefully considered; if used sparingly, it can add tremendous impact to a performance.